Sarah Militano heard the news last Friday and came home with an idea on a new way to spend their sports-watching dollars. Her husband Marshall had already beat her to the punch. Marshall Militano and his wife, Sarah, secured 'Lopes basketball season tickets once they heard Dan Majerle was named head coach. Marshall and Sarah are new basketball season ticket holders at Grand Canyon University, jumping on the Antelopes’ bandwagon after Dan Majerle was hired as head coach of the men’s team. “When we heard Dan Majerle, oh wow, we just found another place to go watch basketball,” said Marshall, noting they had previously been season ticket holders for the Phoenix Suns and Phoenix Mercury. “My friend George Smith bought two tickets as well, right next to us. The Militanos of the West Valley are not alone in their new-found interest in GCU. 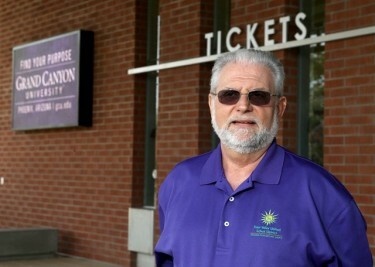 James Hall, box office supervisor at GCU Arena, said they received about 20 new season ticket inquiries the first day after the Majerle announcement. “And we got a lot of employees who had reserved seats last year who called to make sure they could renew,” Hall said. The Militanos were not just casual fans of the Suns and Mercury. They were avid supporters of the teams, serving on advisory boards and attending town hall meetings. But they became disgruntled with the direction the Suns have taken since Jerry Colangelo sold the team, players like Steve Nash and Grant Hill were not re-signed, and a coach like Majerle was not retained. They’ve also taken notice of Grand Canyon University, and said they like what they see. “We see your name everywhere,” Marshall said. “I’m in education and my wife is in education, so we see children and talk to parents. Grand Canyon’s name always comes up. You see the growth, the name recognition and the development. Neither has ever been to a game at GCU Arena, but they do like college basketball. And the price – $200 for a season ticket in their section – couldn’t be beat. “We’ve been spending thousands on the Suns and Mercury,” Marshall said. “We actually wanted courtside seats (at GCU) but there is a little bit of a waiting list for those. If the opportunity arose, we would take that.